Home LYNDENOPOLY Limited Time Pre-Order Info! LYNDENOPOLY Limited Time Pre-Order Info! Lyndenopoly pre-orders Ended July 30th. Missed the pre-sales? No problem! Click below to find out where you can buy yours while supplies last! 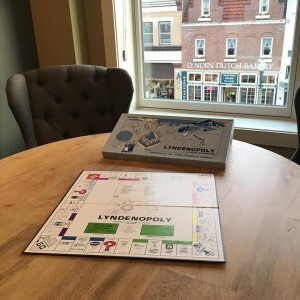 CLICK HERE TO FIND OUT WHERE TO GET YOUR COPY OF LYNDENOPOLY WHILE YOU STILL CAN! PRE-ORDER NOW FOR ONLY $20 AND GET ENTERED TO WIN! Lock down your copy of this limited-quantity local game now to get the best price, get entered to win exclusive prizes, and ensure availability. Reserve yours now! 1. Get the best price: $20/each (vs. $30 regularly). At just $20 each (including tax), the pre-order special won’t last. Even at the list price of $30, Lyndenopoly is a great value for the years of fun and memories it will provide, all while supporting a great cause in the Lynden Chamber of Commerce. 2. Get entered to win exclusive prizes. A never-opened box of the original 1987 Lyndenopoly game: like this one, but still in the plastic wrap! One of only a few left in the Chamber archives, this hard-to-find vintage copy will compliment your 2017 version perfectly. 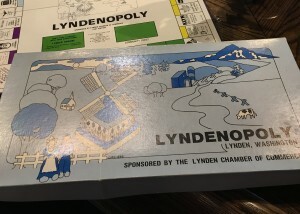 The 1987 edition of Lyndenopoly in the Celebration Suite of the Inn at Lynden. A stay at The Inn at Lynden for a real-life “LYNDEN LOCK-IN”. 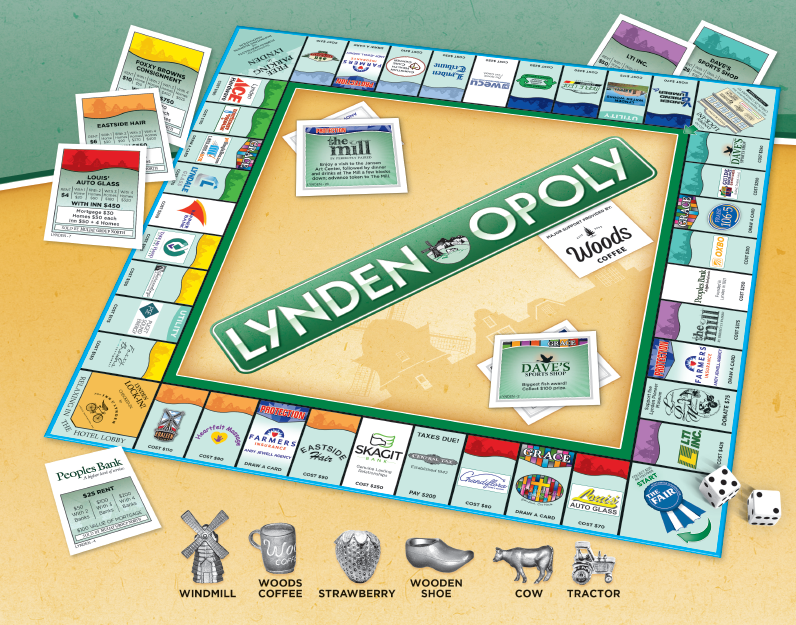 Part of the new Lyndenopoly game is a “LYNDEN LOCK-IN”, where players check-in to The Inn at Lynden on the game board. A lucky winner will get their own real-life stay for two, including breakfast at Avenue Bread, drinks at Overflow Taps, and dinner at Drizzle! Explore your own town in style while you “lock-in” downtown for the night! 3. Guarantee your copy of this awesome limited-edition local game! There’s no telling how quickly they’ll sell out, so the best way to make sure you aren’t left out is to pre-order today. It’s been 30 years since the original Lyndenopoly was printed, and there are no current plans to make another run in the foreseeable future. Many local homes still have the 30-year-old version in play — don’t you want to be part of this great new way to support your community?! All proceeds support the nonprofit Lynden Chamber of Commerce — host of great community events such as: the annual Farmers Day Parade, Northwest Raspberry Festival, Lighted Christmas Parade, and more! Since the local business sponsors on the board paid for the cost of producing the game, 100% of the sales directly support the Chamber! Later this summer you’ll get an email when they’re here and ready for pickup. Then you can head into the downtown office of the Lynden Chamber of Commerce (518 Front Street) to pick up your order. CLICK HERE TO RESERVE YOURS NOW FOR ONLY $20! Where do I get my game when they’re ready? Once they’re here, the Lynden Chamber of Commerce will be the pick-up location. They are located at 518 Front Street in Lynden and are open all week long. Why should I pre-order instead of paying when they arrive? Pre-orders get the best price, entered for exclusive prices, and guarantee your copy is reserved. Check out the great prizes listed above — pre-order and be entered to win an original never-opened 1987 version Lyndenopoly, or a “LYNDEN LOCK-IN” — a stay for two at The Inn at Lynden including breakfast, drinks and dinner! If you’re concerned it’s too long, there’s a 1-hour version in the instructions. Otherwise, it really depends on the number of players and how the game progresses. Either way you’ll have lots of fun memories! How do I pre-order LYNDENOPOLY? Pre-orders can be placed by filling out the form at this link. Just enter your info and payment details to lock yours down. Which Lynden businesses and organizations are on the game? You can see many of the sponsors represented in the pictures above — but by pre-ordering for just $20 you’ll enjoy the complete Lynden-themed game and all it has to offer for yourself! Can you ship a copy to me? Pre-orders are for local pickup only. You’ll get an email when they’re ready for pickup (later this summer) at the Lynden Chamber of Commerce office downtown. While we hope to be set up for shipping when the regular sales start, perhaps ask a local friend to grab or ship yours if you live outside of Lynden area. Will it look just like the pictures here? Lyndenopoly game tokens / playing pieces. Still have questions? Email events@Lynden.org. Having any trouble with this form or payment? Email events@Lynden.org and we’ll help out! Payment hosted on a secure embedded Wufoo form integrated with Stripe (more info here).